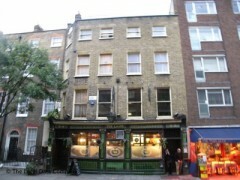 About: The Lamb is a traditional Victorian pub frequented by locals. There are seating areas and a small yard outside for summer days. Catering for private parties of up to 30 seated guests is available upon request. It starts with those classic emerald green tiles that line its exterior and just gets better inside. The Lamb is one of London’s most handsome traditional alehouses, which is fitting since it is on the equally pretty Lamb’s Conduit Street. Booths, bar stools, dark stained wood, brass and glass decorate the interior and in keeping with what seems to be a trend in these glorious traditional pubs, there is no music. The Lamb was Charles Dickens’s favourite pub and still remains right around the corner from the museum that bears his name. Still a lovely old pub, this one might even give you an idea of what drinking houses were like back in the Dickensian era when writers seemed to spend more time drinking than writing. "Cosy, quiet and warm; The Lamb is a proper London pub..."
First things first; there’s no TV or music on offer at The Lamb; this is a purposefully quiet, classic old pub. On a road as attractive as Lamb’s Conduit street it seems only natural that the pubs located on it are up to scratch. But The Lamb goes above and beyond. A Victorian delight of emerald tiles, black and white images of music hall stars, solid wood paneling and patterned glass, it’s as if nothing has changed here in a hundred years. Being a Young’s pub the choice of beer is predictably safe – think no nonsense lagers and the odd ales on rotation. But that’s not the appeal of The Lamb. The impressively dominant horseshoe bar that stands in the middle of the pub is surrounded by green leather couches, bar stools, old copper pub furnishings and a delightful tartan carpet. There’s a reason why this is often the first name that springs to mind when thinking about London’s most classic pubs. The lack of TV and music means the pub can feel peaceful and almost meditative during the day – a slice of quiet London. Food is the usual pub grub that is done enough service by merely mentioning the fact that it’s served. Besides, you should be visiting by yourself for the meditative qualities, not the food and drink. Or alternatively, visit with friends for some conversation in one of London’s cosiest Victorian pubs.